Accepted Scientific Name: Rebutia wessneriana Bewer. Origin and Habitat: Jujuy, Northern Argentina. Altitude range:1600-2400 metres above sea level. Rebutia krainziana var. wessneriana (Bewer.) Krainz & Haarm. Rebutia senilis var. hyalacantha Backeb. Rebutia krainziana f. beryllioides (Buining & Donald) Krainz & Haarm. Rebutia krainziana var. breviseta f. beryllioides (Buining & Donald) Krainz & Haarm. Rebutia krainziana var. hyalacantha f. calliantha (Bewer.) Krainz & Haarm. 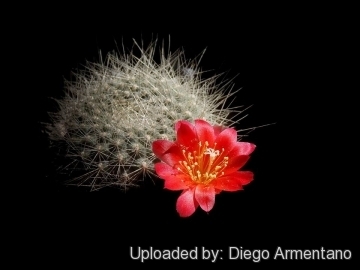 Rebutia permutata var. gokrausei Heinrich in Backeb. ex Backeb. Rebutia permutata f. gokrausei Heinrich in Backeb. ex Backeb. Rebutia permutata Heinrich ex Backeb. 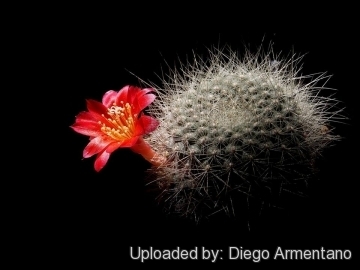 Description: Rebutia wessneriana is a tiny freely clustering cactus, branching at ground level to form low dense groups or mounds up to 15 cm wide. Rebutia wessneriana is a good species regarded separately from Rebutia krainziana, with which it has sometimes been linked, and the numerous subspecific names are regarded as synonymous, but some authors consider this species as one of the morphological form of the widespread and variable Rebutia minuscula, distinguished by long white bristles and large, blood-red flowers with yellowish throats. Rebutia wessneriana is a highly variable taxon, which reacts strongly to environmental conditions, in particular the size and number of spines is greatly influenced by the level of light, at lower light levels the spines are less numerous, delicate and white, while with strong solar radiation the spines are stronger with a brownish tint. In some cases differences are referable to separate population. Many such variants have been described as species in the past. Derivation of specific name: This member of the Cactaceae family was given this name in honor of the German merchant and owner of a cactus nursery Wilhelm Wessner (1904-1983). 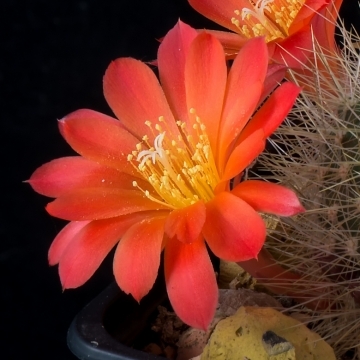 Wessner's rebutia. Stems: Depressed globose, bright green or reddish-green in strong sunlight, lacking spines apically, to 7 cm high and 8 cm in diameter, with fibrous roots. Ribs: Spiraling, not always completely divided into tubercles, tubercles up to 2 mm, hexagonal when present. Areoles: Elliptical, white 5 mm long, 5 mm apart. Spines: About 25, about 20 mm long, hardly distinguishable as radial and central, stiff, bristle-like, interlacing molstly white, uppermost ones sometimes with brownish tip. Flowers: Heterogamous, borne on sides of stems, bright scarlet to bloodred with yellowish throats, to 5.5 cm in diameter. Pericarpel and floral tube red with violet red scales. Perianth segments narrowly lanceolate, long-pointed, about 30 mm long and 6 mm wide. Filaments reddish, anthers pale yellow. Pistil pink-orange, basally fused for 2-3 mm with the narrow flower tube. Fruits: Globose, 5-7 mm in diameter, pale violet to dull reddish violet, with purple scales. Seeds: Oblong, over 1 mm long; testa glossy black; hilum basal yellowish white. 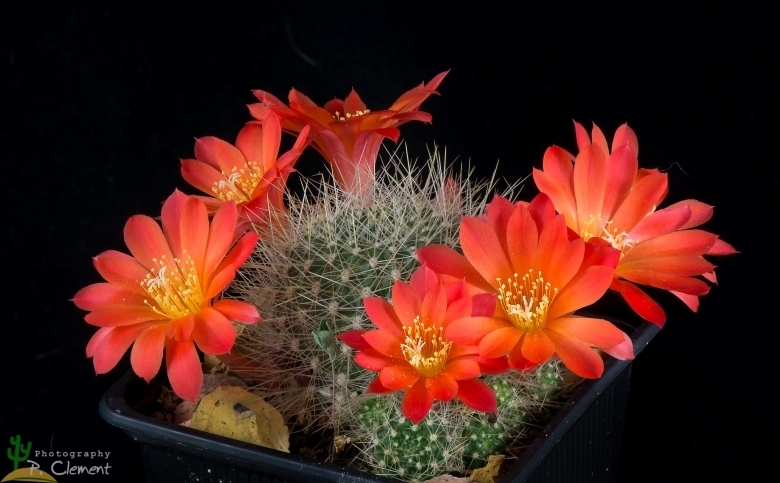 Cultivation and Propagation: Rebutia wessneriana is a summer grower species that is easy to cultivate. Repotting: It is better that they are repotted regularly. Repotting will increase the number and size of stems and will increase the number of flowers produced. Repot yearly until reaching about 100 mm in size, then every two or three years will suffice. Repotting is best done at the end of winter but can be done at other times. Do not water for a couple of weeks after repotting to reduce risk of root rot via broken roots. Use pot with good drainage.